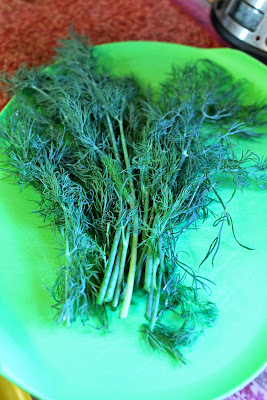 Bossy Italian Wife : Quick Fix: Leftover Herbs! How many times has this happened to you: you go to the store to get a bunch of herbs because you are making a recipe that calls for it. When you get home, you realize that need a fraction of what you bought. And you use what you need and you put the rest in the refrigerator, as you solemnly vow to use it before it goes bad. BUT, by the time you remember your vow to use up said herb, it's been far too long and the herb has gone bad. Because this happens to me, like, ALL THE THYME! Hehe. A little herb joke for you out there. The point is, these herbs needn't be wasted. I hate waste. It's a huge problem and I aim to eliminate as many of my personal wasteful habits as I can. Today, let's tackle some herbs together. Say it with me: we're gonna freeze it! Because, seriously, who needs this much dill? I know I sure didn't. 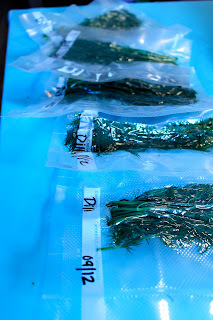 So I got the idea to portion it into more user-friendly bunches, vacuum seal it and freeze it for later use. 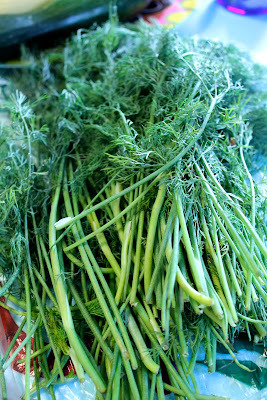 I gave those extra long stalks a little trim, too, just before I packaged them. And can we talk a moment about the importance of labeling?! How, once it's frozen, will you be able to tell the difference between your herbs?! You must, therefore, label your herbs. And everything else for that matter. Hehe. I ended up getting an astounding five packs of dill! Holy cow! When you take it out of the freezer let us please know who it turned out.